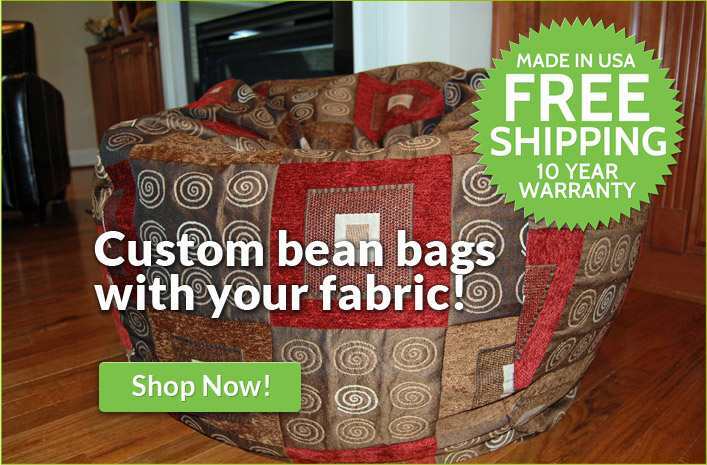 Bean Bag Chairs: WASHABLE Bean Bags, 10 YR Warr, Made in USA. Yes! American-made quality that lasts years, backed by a 10 year warranty. 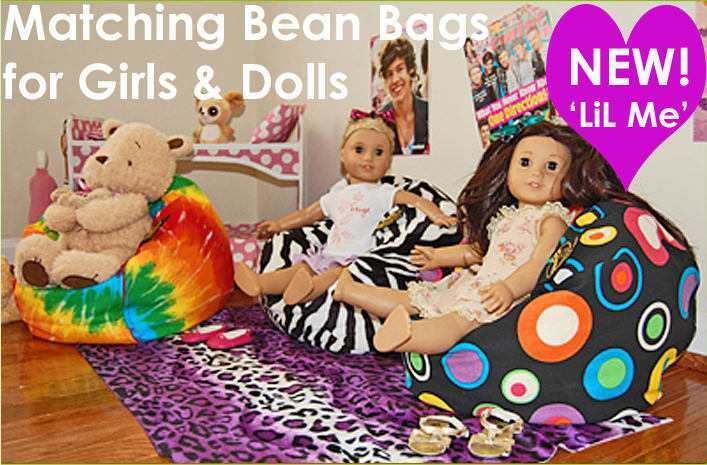 Washable bean bag chairs for kids and adults in more unique styles than anywhere else. Endorsed by Better Homes & Gardens and the Washington Post. Enjoy them from toddler years to college and beyond! Now that's VALUE! Don't go cheap and regret it. No one else offers our exclusive water-repel liner that is so strong, it will hold up to the toughest kid without breaking. No leaking filling here! Also find separate washable covers, blankets, and filler. We are a full-service, one-stop shop - in business over 15 years! Thousands of happy customers, beanbags still in use since 1998! Personalize any of our products with a beautiful embroidery! Your child will be tickled to see her name. Or, how about "dream"? We use top-notch materials and offer a ton of cool letters and colors for very unique bean bag chairs. We also offer a custom service where we use your fabric to match your decor perfectly. COM - Order Bean Bags Made from Your Fabric! 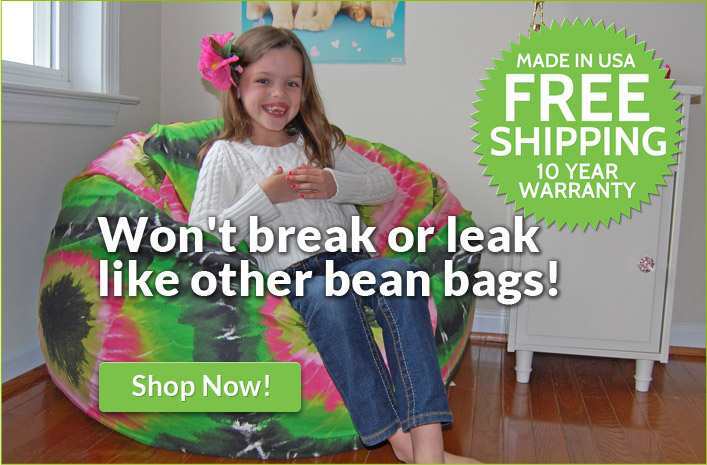 The ORIGINAL bean bag chairs with washable covers PLUS water-repel liners...Since 1998! So, you're wondering...where can I get a bean bag chair that's great quality and that my whole family will love? Your children will love them as gaming chairs or in their very own reading nooks. And when it's time to head to college, they will be taking them along, too. Heck, they can give them to their kids eventually! Now that's VALUE! What makes us different? For starters, these are not sacs or poofs or fufs or foofs, which are filled with shredded cushion foam. Ours are filled with styrofoam pellets, so you get more structure and you can sit up in it like you would expect to. We offer products that are superior in style and strength. So, not only will you be adding beauty to your home, you won't ever have to worry about leaking filling flying everywhere because your liner broke or your cover ripped open. Not to mention our exclusive liners are water-repellent unlike others. We also care about your safety by having child-resistant zippers and following other safety regulations. We even offer eco-friendly, certified organic, and hypo-allergenic! Plus, free shipping, a 365 day return policy, and a whopping 10 year warranty! Everyone here believes in providing excellent customer service before, during, and after the sale because we know our customers keep us going. We believe in honesty and Made in America quality. We truly want to help you find the right one for your entire family. Join the thousands that have turned to us since we opened our doors in 1998. Welcome! "We bought one of yours years ago in 1999 and it is still like brand new. It is used every single day by our entire family and company when they come. What I love most is the ability to take the cover off and wash it. It is one of our favorite pieces of furniture for sure." "We love ours! We've had them forever, like 1999 or something. Our kids grew up in them, now they want their own. They have totally held up over the years." -owner of 9! "We got 4 of your chairs a year ago. Our basement flooded twice! All we did was wash the covers and they were fine. The liner kept the filling dry! No mildewy smell at all! You can use that as a satisfied testimonial!" "I've got kids that never take naps, they're sleeping in theirs right now!" "Oh wow! We bought the bag originally as a gift to my husband but our son with severe SPD crawls underneath when he is melting down...nothing else has ever helped like it does." "Thank you so much for the great product! I wanted to let you know that Kelly + John Travolta received it and she loves it. Thank you so much!" "Got it today, wow! We love it. Seems like it is extremely well made, very sturdy, heavy weight denim. We bought one a couple years ago from another (well known) company, it has fallen apart. It was made with very thin material. Very disappointing. I feel confident we will have many years use from this new one. Thank you so much." "My son has Autism. I bought one of your large ones 6 years ago and to this day, it is still one of his most beloved items. Thank you!" "We ordered a phenomenal chair from you! We really do love it! (Parent of child with sensory concerns)"
"We are so happy with our awesome chair! Our daughter is in a spica cast, I'm a pediatric nurse and it's been so frustrating to find a product for her. Pillows only do so much, and the beanbags in the stores don't work. Yours is a life saver, I think I'd cry without it." "We recently ordered from your company. We have had our Infection Control staff review the data and perform their own inspections on your product. I am pleased to announce that your product has won the approval for use within our institution. Our patient population is primarily oncology based so we have stringent guidelines in place to insure the safety of our patients. We are absolutely loving them. They are everything you promised and more! We have to wash them by color because the children won't let us take too many away at one time!"